Milano-Sanremo, the first Classic Monument of the season, brought to you by NAMEDSPORT>. The route is almost identical to 2017, covering the Turchino, the Capi, the Cipressa and the Poggio, for a total distance of 294km. There are 25 teams at the start (18 UCI WorldTeams plus seven wildcards), each with seven riders. The 174 riders passed km 0 at 10:07. Did not start: dossard number 73, Loic Chetout (Cofidis, Solutions Credits). The following riders will be equipped with the Velon data-tracking system: 1 Michal Kwiatkowski (Team Sky), 35 Matej Mohoric (Bahrain – Merida), 51 Greg Van Avermaet (BMC Racing Team), 71 Christophe Laporte (Cofidis, Solutions Credits), 91 Sergey Firsanov (Gazprom – Rusvelo), 115 Jens Keukeleire (Lotto Soudal), 121 Matteo Trentin (Mitchelton – Scott), 133 Carlos Barbero (Movistar Team), 145 Juan Jose Lobato Del Valle (Nippo – Vini Fantini – Europa Ovini), 161 Edvald Boasson Hagen (Team Dimension Data), 171 Sacha Modolo (Team EF Education First – Drapac P/B Cannondale), 192 Enrico Battaglin (Team Lotto NL – Jumbo), 211 Michael Matthews (Team Sunweb), 221 Jasper Stuyven (Trek – Segafredo), 231 Alexander Kristoff (UAE Team Emirates). Milan (10.00 – start): rain, 8°C. Wind: weak – 6kmh. San Remo (17.00 – finish): slightly clouded, 12°C. Wind: moderate – 14kmh. 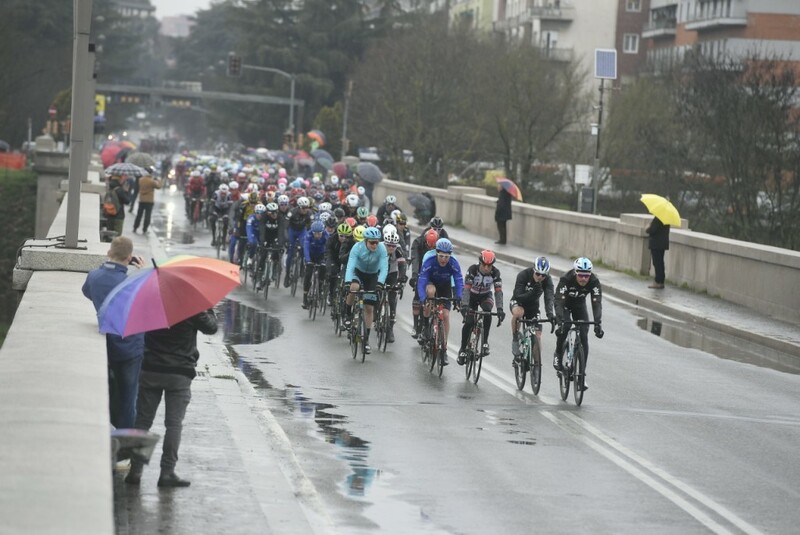 The Milano-Sanremo, brought to you by NamedSport, follows the classic route that has connected Milan to the Riviera di Ponente for the past 109 years, namely via Pavia, Ovada and Passo del Turchino, before descending towards Genoa Voltri. From here, the route heads west, passing through Varazze, Savona, Albenga, Imperia and San Lorenzo al Mare where after the classic sequence of the “Capi” – Capo Mele, Capo Cervo and Capo Berta – the peloton negotiates two climbs that have become part of the route in recent decades: the Cipressa (1982) and Poggio di Sanremo (1961). The Cipressa is just over 5.6km long with a gradient of 4.1%. The descent leading back down to the SS 1 Aurelia road is highly technical. One may even claim that Milan was Leonardo’s city. The Last Supper, the Atlantic Codex, the Naviglio Grande gates, as well as frescoes, paintings and myriad drawings and designs are a sample of the heritage that Leonardo – an architect, engineer, inventor, scientist and artist – left behind during the 20 years he spent in the city. The church of Santa Maria delle Grazie holds one of the most famous religious artworks of the Renaissance, “The Last Supper”, a mural that Leonardo da Vinci painted between 1495 and 1497, as commissioned by Ludovico Il Moro, Duke of Milan. Tortona has been a significant strategic centre since Roman times. Located at the boundary between Piedmont and Lombardy, it still serves as a major motorway and railway hub. This town, sitting on the banks of the Scrivia River, has a rich historical past, and has been the setting of wars and battles, including the famous Battle of Marengo, fought on 14th June 1800. It was dominated by warlords including Frederick Barbarossa, Ludovico Il Moro and Napoleon Bonaparte. The name of Tortona is also entwined with the history of cycling: it was home town to Giovanni Cuniolo, one of the forerunners of this sport, three-time Italian Champion and winner of one edition of “Il Lombardia” (1909), and to Luigi Malabrocca, the “black jersey” of the Giro d’Italia. From the hills in the up-country – with wide olive groves – to the sea – with beach resorts – the town is basically divided in two: Taggia, a historic centre of Valle Argentina; and Arma, overlooking the Ligurian Sea. This territory has had a long history (allegedly, the first settlements date back to pre-Roman times), and it is strongly linked to its past, customs and rich folklore, with many suggestive historical reconstructions. One of the oldest re-enactments of the whole region is the Festa di San Benedetto Revelli, featuring parades, exhibitions, fireworks, bonfires and music, to commemorate the vow of the Patron Saint in 1925, to protect the town from pillage and tyranny during the Thirty Years’ War. Every year, Arma di Taggia hosts the “Premio Ossi di Seppia”, a national poetry and literature contest dedicated to Eugenio Montale. Last winner wearing the Rainbow jersey: the last UCI Road Race World Champion who won in Sanremo wearing the Rainbow jersey was Giuseppe Saronni in 1983.